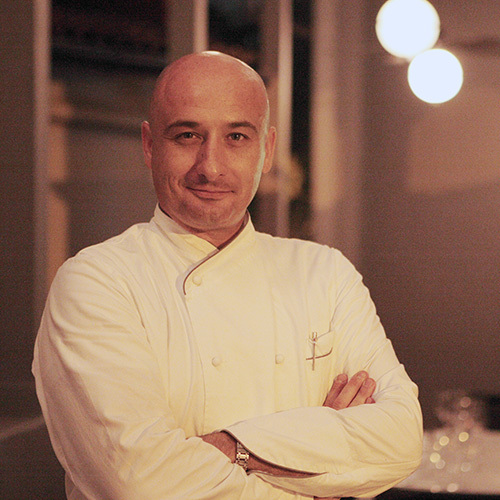 Chef Diego Chiarini, Executive Chef and Partner of Singapore’s Italian restaurant, OSO, is both highly experienced and traveled, and has been internationally recognized for his unique style of cuisine on numerous occasions. Having worked in Asia since 1996, Chef Diego was keen to make the move to Singapore (formerly from SENSO) and sees the new venture – OSO Ristorante as being something he has always had an interest in doing. Chef Diego has worked in some of the world’s leading restaurants, including Bice, located in the Tokyo Four Seasons Hotel, which has been voted one of the ten best Italian restaurants in the world. Other prestigious venues such as the Royal Monceau Hotel, Paris, the Four Seasons Hotel in Milano, and the Hotel de Paris in Monaco have witnessed Diego’s enviable talent in the Kitchen. Chiarini cites one of his leading influences as Alain Ducasse, the world famous chef de cuisines, which he worked alongside at the Hotel de Paris, Monte Carlo. A frequent contributor to (amongst others) a best selling French food magazine ‘Cuisiner!’, writing his own column and features for readers throughout France and added to Chiarini’s credibility in the industry. Similarly, whilst employed at the Carpaccio restaurant, it was voted BEST foreign restaurants in the Famous ‘Henri Gault, Guide des Restaurants Etrangers de Paris’. Fluent in three languages, Italian, French and English, and with a strong working knowledge of Japanese, Diego has worked in some of the finest locations in Europe and Asia, and now he brings his style to Singapore – with OSO Ristorante.